This horse is wearing an interesting bridle of striped woven fabric. It also has a nifty necklace, probably a good luck talisman (or what was historically considered to be a good luck talisman and is now just considered pretty decoration). Necklaces and collars are not uncommon horse decoration - I've seen them on African, Mediterranean and Middle Eastern horses in particular. I'll find some more pictures on that topic in the future. "Summer and winter, the Turkmen covered his precious steed with a felt blanket, which in winter kept off howling winds and in summer protected against stinging flies. On top of that he put a stiff saddle, a pillow and a silk cover, and then draped his horse in necklaces studded with turquoise and carmine, stones which were believed to protect the rider against evil spirits-of which there were plenty to imagine in the vast Kara Kum Desert." It is possible that that cultural idea was widespread in Central Asia and the Middle East, and may be why this Turkish horse's necklace has red and blue beads in it. Photo: Adam Franco on flickr. The Menorcan horse is related to the other Barb-influenced breeds, like the Lusitano and Andalusian, and the style of riding is similar, too. 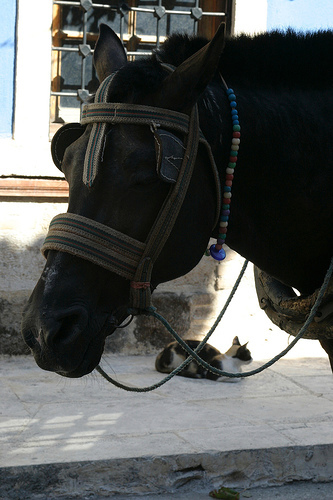 The distinctive thing about Menorcan horses is that they are taught to rear and walk on their hind legs. It is the fashion and custom, and at festivals the horses parade around in the crowded streets, rearing up to please the onlookers. This site (in German) has some beautiful photos and info about Menorcan horses. And this is a guy showing off his pacer for the camera. The breed is called the Arravani. Everyone loves a horse race. This guy is showing off the speed of his pacing horse in Turkey. It's pretty speedy. The National Coach Museum of Portugal has a beautiful collection, including ornate swords and shields, gilded royal coaches, elaborately embroidered saddlery from around the world. 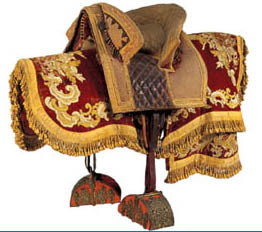 The website (English and Portuguese) highlights many items in the collection, including the Portuguese saddle shown here. The website is nicely done, with excellent photographs. Worth a visit. If you've been to the actual museum in person, please share your experience in the comments. One thing that seems to be universal when it comes to humans and horses is the desire to make the horse dance. Or to interpret its movement as a kind of dance. In this Spanish example the rider guides the horse through intricate patterns. To teach the horse this kind of accuracy of movement takes years, and a Zen mind on the part of the rider. The long stick (garrocha) is traditionally used to move cattle on the range. This art form - Doma Vaquera - is performed competitively throughout Spain.